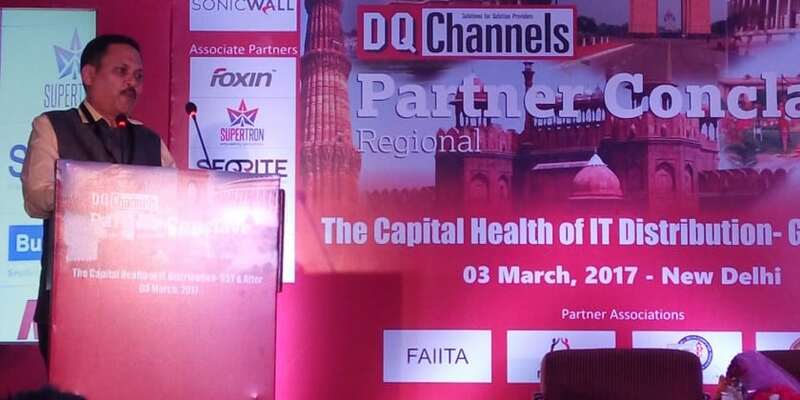 The DQ Channels mega event Regional Partner Conclave, held on 3rd March, took off to a grand start at the India Habitat Centre, Delhi in association with Federation of all Indian IT association (FAIITA), Progressive Computer Association of IT (PCAIT), Computer Media Dealers Association (CMDA), All Delhi Computer Dealer Association (ADCTA). The Regional Conclave held at Jacaranda Hall, India Habitat Centre witnessed huge crowd comprising Channel Partners, software companies, start-up entrepreneurs from North India. The participants got groomed in technological platform, got insightful learning about sponsored companies during the event. One major highlight of the event was GST session where future and the implementation of GST was discussed. Honorable government officials Nikhil Chandra, Additional Commissioner, Service Tax and Naveen Gosain, Assistant Commissioner, VAT started off the event drawing the GST roadmap from 2017 and discussing the challenges and changes partner should make conducting a GST workshop and also solved GST queries of the partners present at the conclave. The participants also got insights about OEMs including Supertron, Seqrite, SONICWALL, CANON, X10, FOXIN, DOEL, PRODOT, BUSY Infotech, BPE and NNR IT solutions during the event. Rahul Arora, Regional Manager, North & East Region, Sonicwall talked about Ransomware and its solution, while Asim Hussain of X10 talked about financing options for enterprises. Representatives of Seqrite and Supertron also gave presentation to audiences. The conclave recognized the efforts of top performing partners in the country by presenting them with Business Excellence Awards. Prarthna Gupta MD of Cache Technologies was felicitated with Best Women Entrepreneur. Ranjan Chopra MD of Team Computers and Devendra Taneja of PC solutions were awarded for their contribution in the field of IT for the last two decades. Concluding the event, Ranjan Chopra entertained the audience with his saxophone performance. GST Roadmap revealed at The DQ Channels Partner Conclave 0 out of 5 based on 0 ratings. 0 user reviews.